Over time we tend to form social groups of people with similar views to ourselves. Those of us join organisation and associations will of course do so with people who we think are like-minded. As such, it is usually the case that the discussions we have on various subjects – both formal and informal – take place with people who have not hugely different points of view. I recently attended a discussion that was attended by people from a wide variety of different political, philosophical, cultural and religious backgrounds – which included hugely divergent and inimical viewpoints. Furthermore everyone was pretty good at articulating their points of view. The subject of the debate was meant to be whether scientists should operate under a “moral compass” (but quickly went off track, perhaps to the benefit of the discussion). We started off considering the issue of whether scientists have the responsibility of considering the long term implications for good or bad of their attempts to push the boundaries of human knowledge and should they bare responsibility for any bad that may occur as a result of their research. The discussion is a series of events to mark the 70th year since the nuclear attack on Hiroshima during World War II. Everybody who felt they had the “correct answer” (so to speak), quickly realised that they didn’t! The kind of discussions and debates which I had attended for a number of years tended to attract people of quite similar backgrounds and perspectives, with variation mainly only on technicalities. But here we had people of radically different, sometimes inimical perspectives and outlooks on life as a whole. 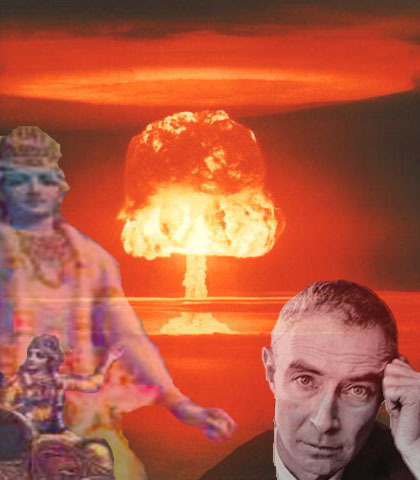 My own views on the subject went in along the lines of the following article about Oppenheimer and the nuclear bomb: The Bhagavad Gita, Oppenheimer and Nuclear weapons. Oppenheimer was deeply inspired by the Bhagavad Gita, and he appeared to find solace in the teaching that “Your rights are to action, never to the fruit”, therefore drawing a line between the research and the longer term result of it. I still largely stand by this as the foundation of my approach to the subject – but after the discussion I can appreciate the complexities better, and there are many grey areas to consider, such as the intentions of the scientist, whether the scientist had considered all of the information available to him/her, the nature of the political regime under which the scientist was working, and whether the scientist was working for a profit motive while knowingly creating technology for an unwholesome company or regime. In many ways – these issues spill over to considerations that many of us face when deciding our course of actions (karma) through many aspects of life. It is beyond the scope of this article to delve any further into this complex subject. Once it was realised that the dilemma underlying the original discussion was largely understood yet unconcludable, the subject started veering round to judging western civilisation and society compared with other oppressive regimes of the recent past, such as Nazi Germany and Saudi Arabia, and whether one society or civilisation had the right to make an intervention to stop a practice which they found morally reprehensible in another society, country or culture. Interestingly, many of the participants, mostly westerners themselves, actually felt that in many ways Western society is actually worse than other oppressive regimes, because the lifestyle choices that we all make on a daily basis, as well as the economic self-interests pursued by our governments actually kill more people than and cause more misery in poor countries than even Hitler could have achieved. This no doubt is a harsh, though not unfounded argument, and we then discussed what could improve this abysmal state of affairs. Here the discussion really came into its own, with viewpoints put forward from socialists, communists, anarchists, conservatives, and of course me (the lone centrist Hindu present). When we discuss subjects like this with people of widely divergent views, yet maintaining a civil discourse, it has the effect of breaking down barriers of understanding between different groups of people. We realise that many of the people who we find to hold what we would see as “wild” views actually are pretty similar to us in what they would like to see in the world, only they perceive very different attempted solutions. I realised the sincerity of many people who I would have dismissed as foolish, and judging by chats we had after the formal debate had ended, I think everyone felt the same. Being faced with articulate yet opposing viewpoints to one’s own forces us to consider the point of view of the other, and sharpen our own understanding and delivery of what we have to say. In some cases it may cause us to reconsider and reformulate our own views, and hopefully we will equally be able to get “opponents” to see things from our point of view. I feel I was justified in feeling that my views, which drew upon Sri Aurobindo, were quite refreshing and unheard of by the others present. This is much better than staying within our comfort zones and continually discussing things with people who already agree with us.